Entrance Hallway: 12’3” x 6’7” Hardwood flooring. Crown mouldings. Chandelier. Custom leaded glass on front door side lights and transom above. Living Room: 20’ x 17’4” 12’ ceilings. Hardwood flooring and custom millwork. Crown mouldings. Built-in arched book shelving with storage below. Fireplace with marble hearth and arched surround. Gas logs. Dramatic floor-to-ceiling arched triple window overlooks deck and private rear yard. Staircase to second level with open balcony overlooking the living room. Recessed lighting. Ceiling fan. Library: 13’7” x 13’4” 11’2” cove ceiling. Lovely tall Venetian window. Hardwood flooring. Custom built-in cabinetry and book shelving. Dining Room: 14’1” x 12’2” Hardwood flooring. Crown mouldings. Built-in granite-topped cove buffet with mirrors above. Recessed lighting. Please note: Dining room chandelier shall not be conveyed with the property. Kitchen: 14’1” x 10’6” Counter seating. Hardwood flooring. Crown mouldings. Granite countertops with ceramic backsplash. Jenn-Air gas cooktop with downdraft. GE wall oven. GE built-in microwave. GE Profile side-by-side refrigerator/freezer with ice and water dispenser. GE Profile dishwasher. GE trash compactor. Double sink with disposal. Instant hot water dispenser. Granite-topped raised bar with seating. Granite-topped built-in desk with glass front cabinetry above. Raised-panel cabinetry. Pantry. Recessed lighting. Under-cabinet lighting. Casual Dining Area: 13’6” x 10’6” Hardwood flooring. Crown mouldings. Tall windows. Opens into sunroom. Please note: Chandelier in casual dining area shall not be conveyed with the property. Sunroom: 12’6” x 12’ Flooded with light. Ceramic flooring. Floor-to-ceiling windows with transoms with arch detail. French door with transom above leading to deck and rear garden. French door leading to bedroom #2. Ceiling fan. Master Bedroom: 16’ x 16’ Carpeting. Crown mouldings. Two walk-in closets with shelving and built-in dressers. Master Bath: Spectacular! Completely re-designed and rebuilt by KDW Home! Marble flooring. Large frameless shower with marble surround. Oval soaking tub with hand sprayer. Two marble-topped vanities with vessel sinks, drawers and storage below. Private water closet with built-in book shelving and cabinet. Linen closet. Built-in medicine cabinets. Bedroom #2: 13’ x 12’7’ Carpeting. 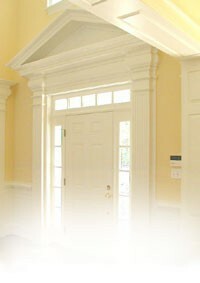 Crown mouldings. Double closet. Ceiling fan. Private full bath. Opens through French doors into the sunroom. Private Full Bathroom: Ceramic flooring. Tub/shower with ceramic surround. Vanity with drawers and cabinetry below. Laundry Room: 8’9” x 6’3” Ceramic flooring. Whirlpool washer and GE Profile dryer, which shall be conveyed. Built-in cabinetry above washer/dryer. Folding counter with cabinetry below. Hand-painted walls. Half-Bath: Hardwood flooring. Vanity with drawers and cabinetry below. Decorative painted sink. Rear Hallway: Crown mouldings. Coat closet plus two additional closets. Access to garage. Bedroom #3: 18’4” x 12’1” Carpet. Double closet. Window seat with storage below. Windows with between the glass blinds. Ceiling fan. Access to private full bathroom. Private Full Bathroom: Ceramic flooring. Tub/shower with ceramic surround. Vanity with drawers and storage below. Bedroom #4: 17’5” x 10’6” Carpeting. Closet. Window seat with storage. Windows with between the glass blinds. Ceiling fan. Access to private full bathroom. Flex Room: 24’1” x 10’ Excellent additional finished and conditioned space for over-flow guests, office, or exercise! Carpeting. Access to storage areas. Recessed lighting. Ceiling fan. Superb master bathroom renovation by KDW Home and kitchen! 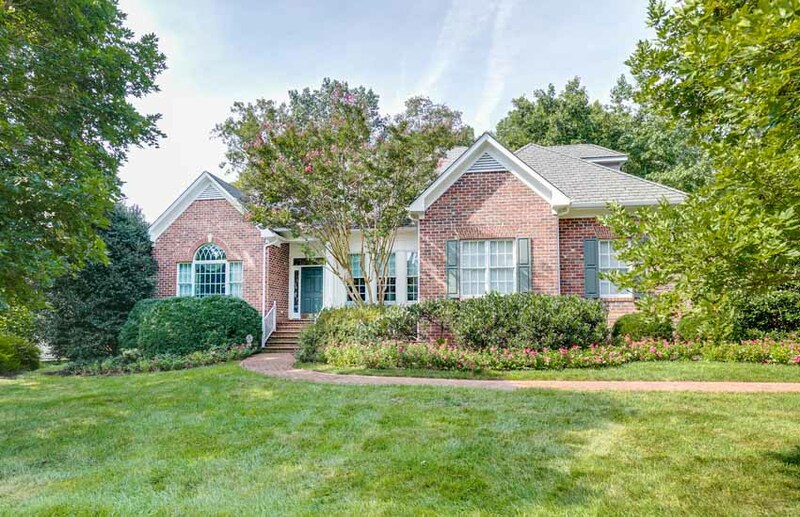 Highly desirable neighborhood located just beyond the Henrico County line in Goochland County, where taxes are considerably lower! Date of Construction: 1996. Expanded “Cranborne” model. $242.25/month and includes road maintenance, snow removal on the roads, care of common areas, water for community-controlled irrigation system, lawn maintenance, excluding shrubs and flower beds. Mulch is provided for front only.